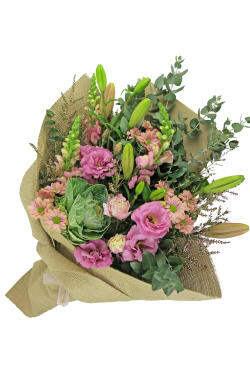 Add My Belle Bouquet to your order? Nothing could be sweeter than our lovely My Belle bouquet, a wonderful gift for every occasion from birthdays to anniversary celebrations! This beautiful bunch features beloved LA lilies, pretty chrysanthemums, elegant lisianthus and spikes of snapdragons, while a single kale and plenty of native gum foliage supply lush accents.